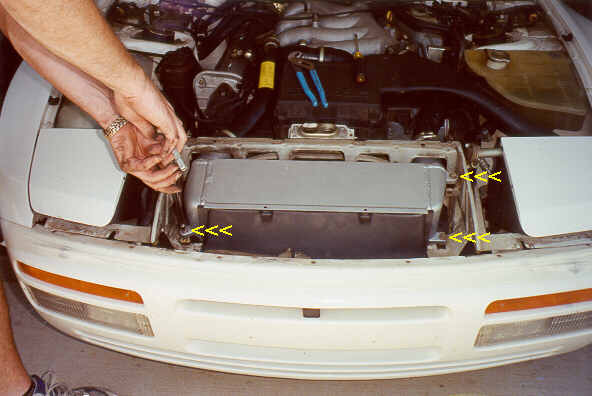 The following is our tutorial on how to "do it yourself" change your intercooler on the Porsche 944 Turbo. It may at this point look like it's a long process, but it's not. The following steps can be very short and most are. First timers can expect to take 1-2 hours. Once you do it once or twice, you can get it done in under 30 minutes. I recommend you read the whole step before you perform it. 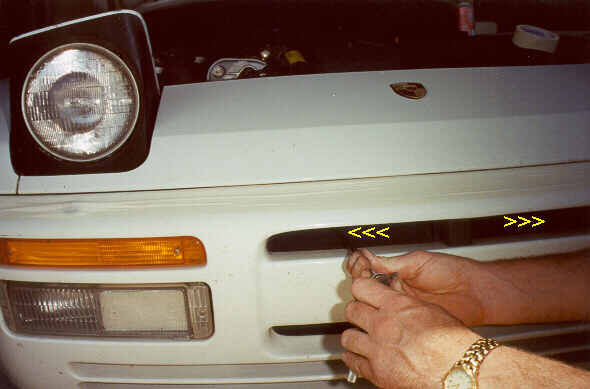 We suggest you put some masking or similar tape on the bumper to protect the finish from scratches when you slide the header panel forward. 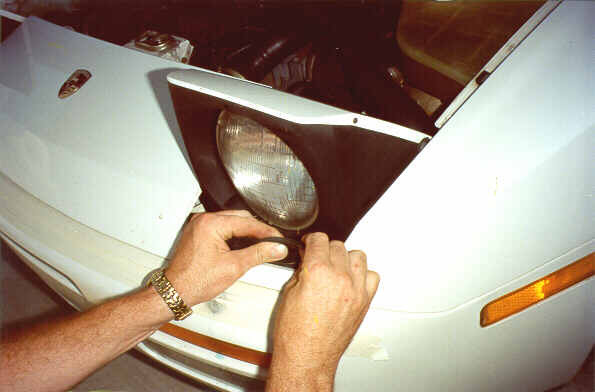 Put the tape right up tight against the header panel. Remove the four #2 Phillips screws across the back of the header panel. 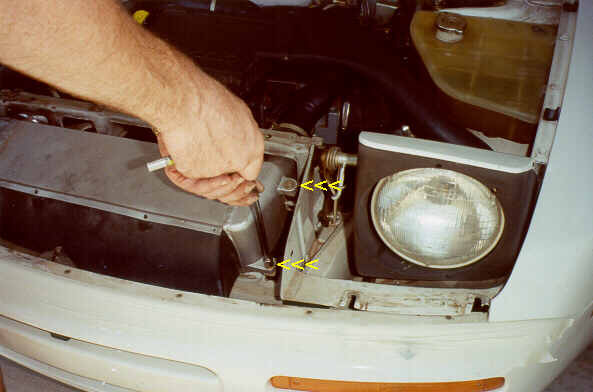 Raise the headlights to access the screws and parts under them. 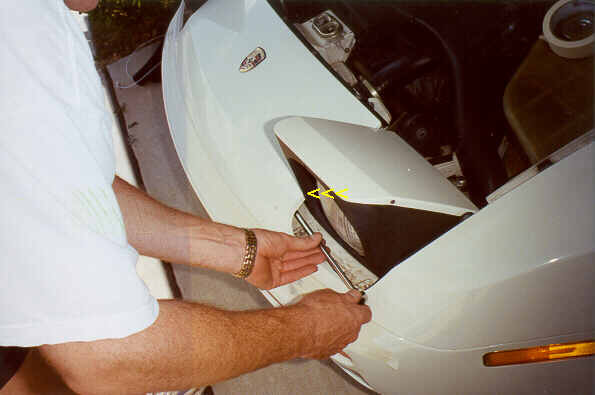 Grab the rubber pieces in front of the headlights and push back and up. We suggest you mark them or temporarily place them somewhere so you can put them back in the correct place later. This will save you from scratching your head later. There is a right and a left piece and they only go in one way. Remove the four 8mm hex nuts and washers. Two on the left side and two on the right side. You could only loosen them but it makes things a little trickier putting it back together since the washers keep getting in the way. Your choice! Remove the two 10mm hex head bolts. One on the left side and one on the right. A 1/4 drive ratchet and a 3" extension work best. Be careful not to swing the ratchet into the paint. Maybe a little tape on the header panel to protect it may be in order. Remove the two bolts. We have seen either Phillips screws or hex head screws here. One on the left side and one on the right. Remove the two 10mm plastic nuts. One right and one left of center. This can be done either now or once the header panel is removed. Carefully and slowly slide the header panel forward. You may need to push down slightly on either end to get it loose. 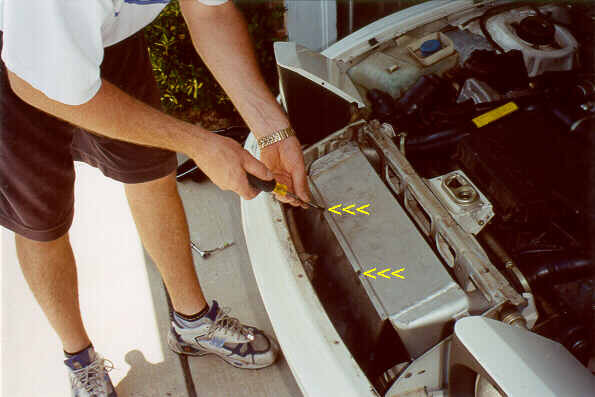 Be careful not to scratch the header or the bumper during this step. A second pair of hands is helpful but not necessary. 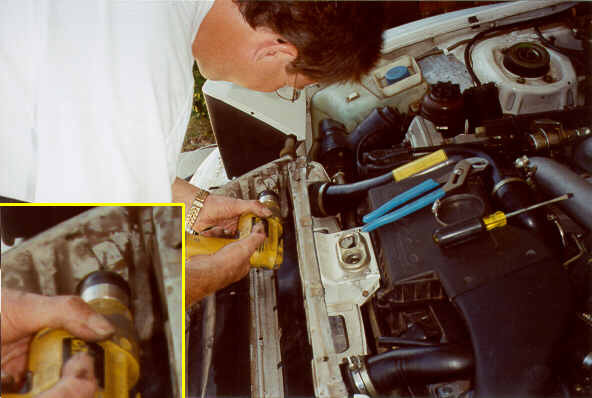 Remove the two #2 Phillips screws that attach the plastic ducting to the intercooler. 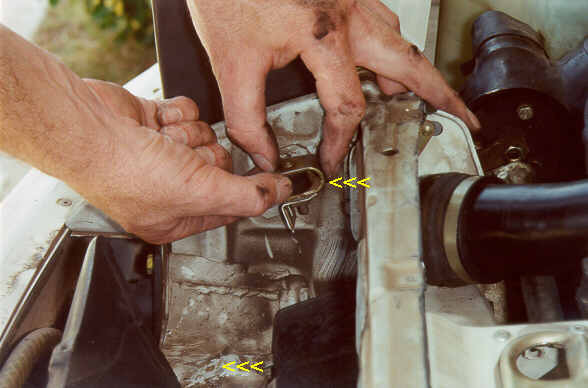 Loosen the two hose clamps that secure the rubber couplers to the intercooler. One on the left(inlet) and the right(outlet). These should be very loose to allow the intercooler to be tipped up. What works well is to loosen them enough that you can slide them over the other clamps. This keeps them out of the way when you re-assemble and insures that you don't forget or drop them. 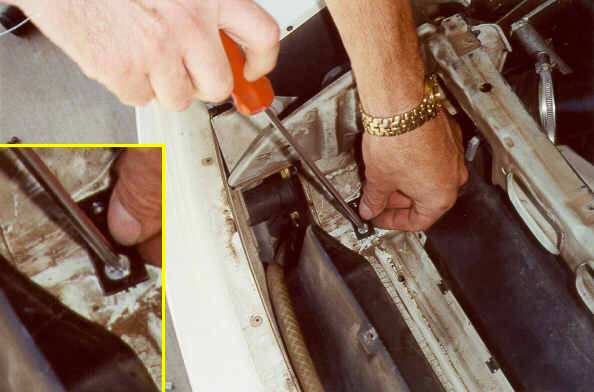 Remove the four 10mm hex bolts with washers that secure down the intercooler. Two on the left side and two on the right side. 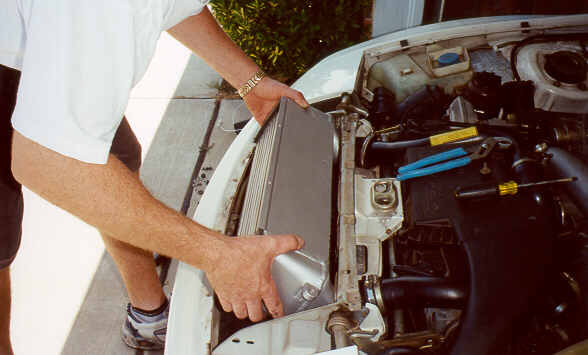 Firmly grab the intercooler and pull forward while you rotate it upward at the same time. You may need to pull the front plastic ducting forward out of the way during this process. It tends to get hung up on the front of the intercooler. No big deal though. Wiggling works well here. 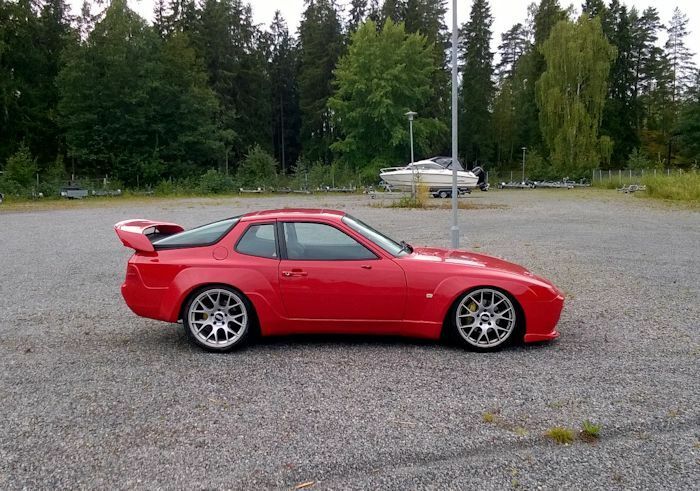 Remove the two intercooler mounts on the right (passenger) side. The rubber cushions have a threaded stud out the back. 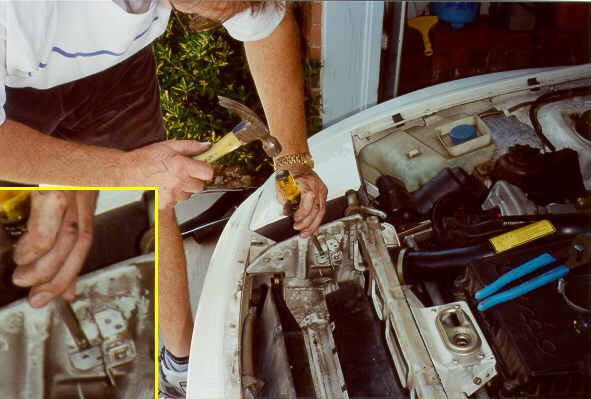 You may have to lightly squeeze the rubber with pliers and turn like a bolt to get them loose. We will be only using one of these during the re-assembly. This is a good time to inspect the two on the left side. If one is broken, then replace with one from the right side. In this photo, the front one is already removed. We must now remove the rear bracket close to the adjoining panel to allow clearance for the enlarged intercooler. We suggest two ways you can do this. One is to cut it off with a hack saw. This would be the quick way if you have a hack saw. Second, is to drill the 4 spot welds that attach the bracket. Try to drill in the very center of the welds. Use a small pilot drill bit such as a 1/8", then move to a larger 3/16" bit. Save the bracket just in case you should ever want to reinstall the stock intercooler later by attaching the bracket with 3/16 pop rivets. Here we are using a chisel and hammer to separate the two parts. Sometimes the welds need a little persuasion. Tap slowly and lightly. A thin screwdriver will also work. Install the supplied bracket on the right forward mounting hole. This bracket has a new threaded hole in it which moves the mounting out about 1-1/2 inches to the right. Place the star washer between the bracket and the frame and attach with the supplied tapered head Phillips screw. Position the bracket facing the right and temporarily tighten. It's alignment is fairly important so do your best to get it aligned. Remember, it faces directly to the right side. We will be re-using one of the rubber mounts and "c" shaped cage. We need to do one of two things here. 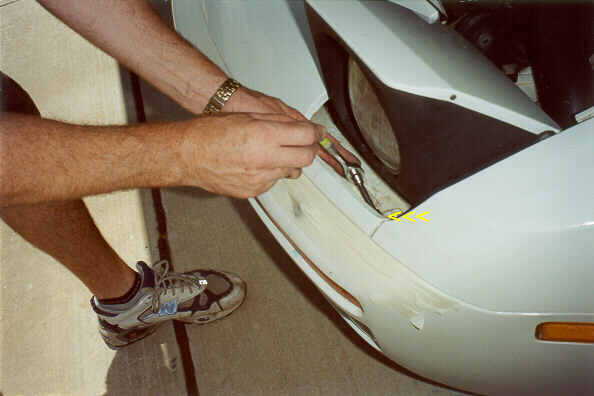 (1) we need to shorten the stud protruding from the rubber mount by cutting it off with a hack saw. Remove about 50% of it. Or (2) our preferred method is to mark a spot in the sheet metal panel behind the bracket where the threaded hole is now located. Swing the bracket out of the way and drill a 3/8" hole which will allow clearance for the long stud to pass through. I recommend a nail (and a hammer of course) or thin center punch to mark the hole location. 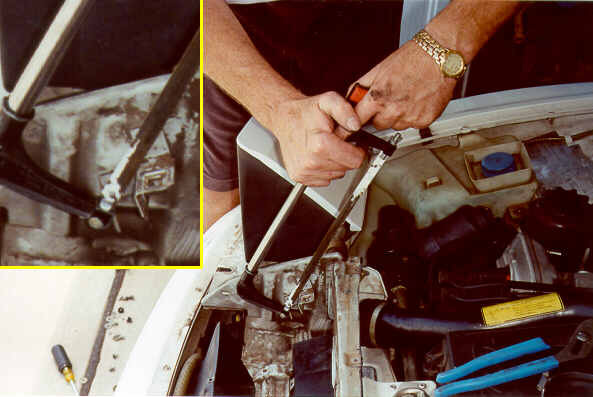 Swing the bracket back to the right position and tighten securely. Install the rubber mount with the "c" cage and tighten. 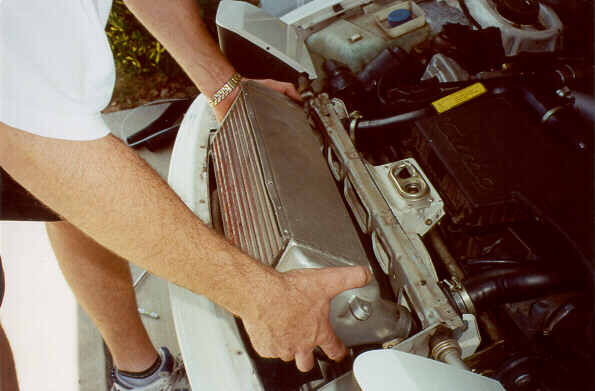 Position the new intercooler and rotate into place just like the way you removed the old one. 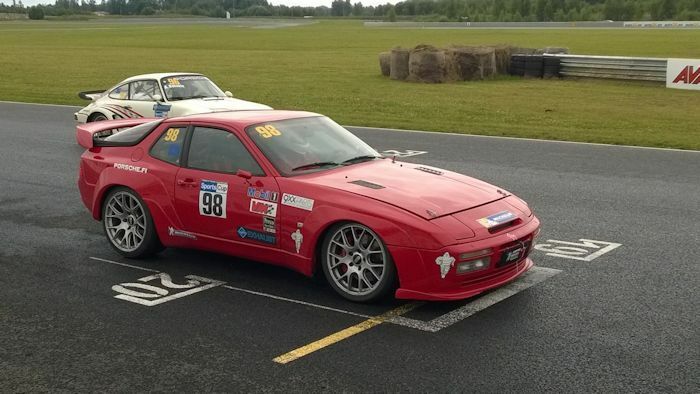 Make sure the intercooler inlet and outlet are slipping into the rubber hoses. 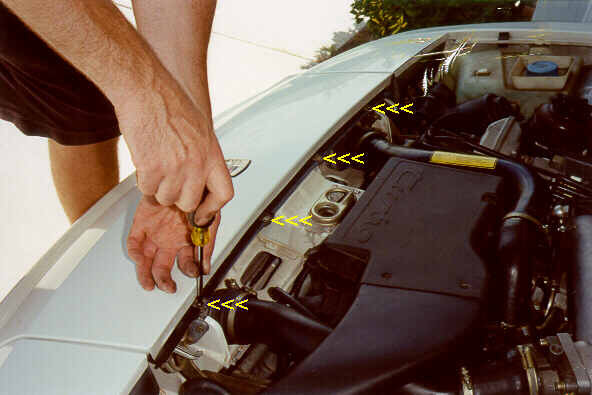 A little WD40 or similar lube makes it easier but is not necessary. This may take some wiggling of things. 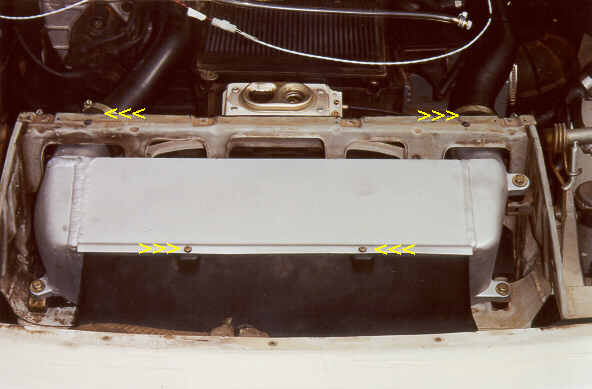 You will have to slightly pull the front plastic ducting forward during the process because it will interfere with rotating the intercooler. 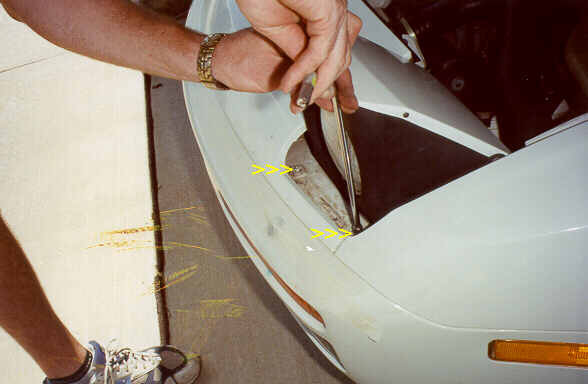 Re-install the three fasteners removed earlier. We will not be using the 4th which was on the right rear of the intercooler. Re-install the two Philips screws connection to the front plastic ducting. 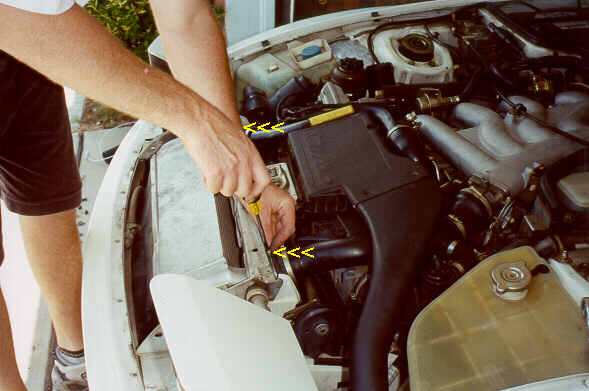 Tighten the two hose clamps at the rubber intercooler connectors. Congratulations !! You have installed your new Lindsey Racing intercooler. From here, you reinstall the header panel in the reverse order from when you took it off. This should run smoothly, however we offer one tip. 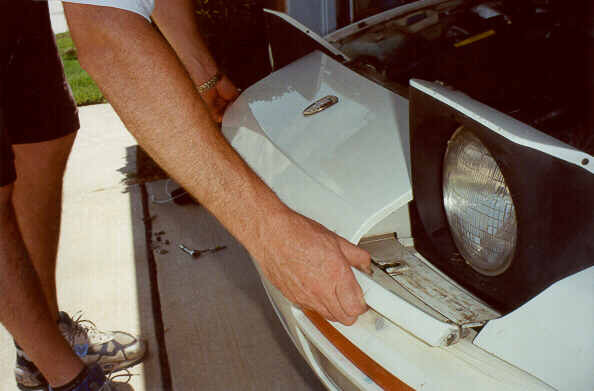 When you reinstall the rubbers beneath the headlights, it makes them easier to install if you spray them with WD-40 or soap them up to make them slippery before pushing them back into place.